In recent years there has been a dramatic change in the way we look at relationships between fungi and trees. 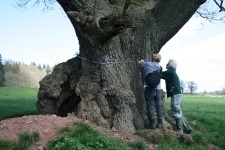 In particular, the hollowing of ancient trees by fungal decay, previously seen as detrimental, is now recognised as a natural part of the ageing process, which can even prolong the lives of trees. Fungi are also essential to much of the wider wildlife values of trees. We only perceive the tree itself but if the cellulose and lignin could be stripped away, we might still be able to see the whole tree in ghostly fungal relief. 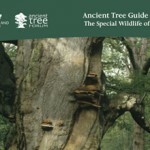 It has been said that every tree provides a unique and dynamic support system for fungi, since almost the whole of every tree is associated with fungi. Certain kinds of fungi, which spread through woodlands below ground – can be extremely large – a honey fungus in the USA has been estimated as occupying an area over 3.5 km in diameter and weighing as much as 650 tons. With an estimated age between 1,900 and 8,650 years, this individual is an example of the great age that such fungi can reach, owing to their continuous growth habit. In principle, this could enable them to live for ever, so that death for them is perhaps accidental rather than inevitable. What do fungi do in ecosystems? Decomposer [cycling] fungi. All fungi are decomposers, at least of simple organic substances, like sugar or starch, but the fungi in this group can break down complex materials; i.e. wood, leaf litter and other plant and animal matter. They are known collectively as saprotrophic (‘decay-feeding’). Those that decompose wood in living or dead trees or in fallen trunks and branches) are known as saproxylic (‘in decaying wood’). The decay of wood releases elements, such as carbon, nitrogen and potassium, while also maintaining a humus layer in the soil. Mycorrhizal [root-associated] fungi – forming symbiotic associations with the roots of trees and spreading out into the surrounding soil, gathering mineral nutrients for the tree like an extension of the root system. They sometimes also protect roots from pathogens and from drought. In return, the tree provides a proportion of its carbohydrates, which it produces through photosynthesis. 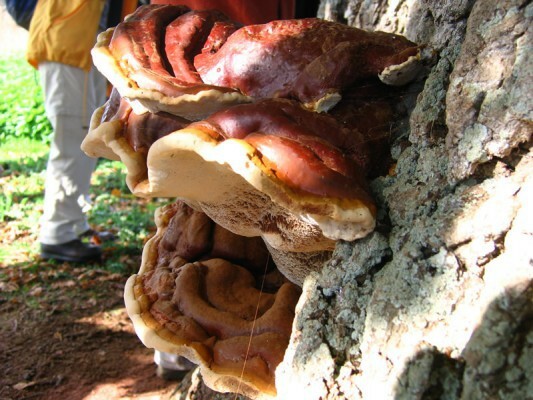 Both the above groups include fungi that are associated with a wide range of tree and plant species. There are others, mainly in the second group, that are more specific in their choice of partners. Wood decay fungi work in a variety of ways, producing different types of decay. The two most obvious types are white rot and brown rot – often referred to as red rot by entomologists. There are several varieties of white rot all of which involve the breakdown of the lignin component of the wood, as well as the cellulose. In brown rots only the cellulose is broken down, leaving the lignin behind but often chemically altered. Do all decay fungi do the same sort of thing? Most wood decay fungi can grow only in wood that is already dead, either in the form of dead branches and fallen trees or in the inner wood (heartwood or ripewood) of living trees, which is no longer needed for water-conduction. There are, however, some that can grow in the living sapwood of trees, by tolerating a lack of oxygen and by overcoming or bypassing the tree’s active defences. Such decay fungi could be regarded as pathogens (‘disease causers’) but their decay is often so restricted that the tree can remain healthy. It is not only trees which are dependent on fungi. Most invertebrates that feed on wood could not do so without the fungi ‘softening’ it up first. The invertebrate assemblages change as decay proceeds and most saproxylic (wood decay) invertebrates are more dependent on the type of decay (e.g. white rot v. brown rot) than on the species of tree. Other invertebrates are directly dependent on the fruiting bodies of fungi. What else do fungi do? There are many other fungi that do not belong to either of the two above ecological groups but that are associated with trees, occurring anywhere from the leaves in the crown down to the root hairs. Some of these fungi, known as endophytes (‘in the plant’) live between the living cells of the tree, while others live inside hollow, dead cells. Others, called epiphytes (‘on the plant’) live on the surfaces of leaves, or bark etc. Yet others live partly inside plant cells and are called biotrophic (‘life-feeding’), as in the case of some kinds of mycorrhizal fungi. 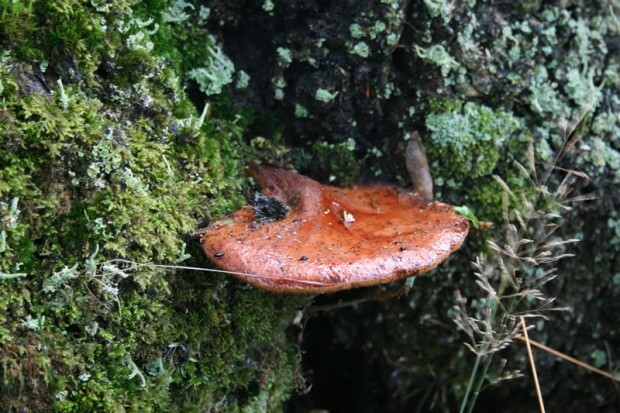 Certain fungi, such as rusts and mildews, can clearly be classed as pathogens and they have conventionally been regarded as ‘bad’. They are, however, increasingly being recognised as an important influence on the composition and structure of woodland communities, for example in glade creation. Disease is thus a normal process in natural systems but it can become problematic elsewhere, for example in commercial forestry, in ornamental plantings or where human activities bring together plants and fungi that have not co-evolved. What is the significance of fungal fruit bodies? Many wood decay fungi produce visible fruit bodies, mostly bracket-like or mushroom-like. Fruit bodies are important for the dispersal of fungi, by producing vast numbers of spores. Also, they provide habitats for many invertebrates, including rare and threatened species. The fruit body is, however, a very tiny part of the organism; much is out of sight as a mycelium growing within and around the woody tissues. Although the presence of fungal fruiting bodies on a tree usually means that decay is present, this does not necessarily mean that the tree has been significantly weakened. This is rarely the case in the main stems of veteran trees but tests can be done in order to find out whether there is any cause for concern. Are there many rare and threatened fungi? Fungi are included amongst the rare and threatened species that are ecologically associated with ancient trees. Of the 447 macrofungi on the British Red Data Book list, nearly 400 are confined to Ancient Woodland and/or lowland wood pasture (pasture woodland). Many of those species have very restricted distributions, especially some that depend on the dysfunctional heartwood (or ripewood) tissues of ancient trees. Loss of habitat – with consequent fragmentation and isolation – is still a major concern in the conservation of fungi. Major losses appear to be happening owing to acidification and increased nitrogen enrichment of soils. Ainsworth AM 2004 Developing tools for assessing fungal interest in habitats – 1: beech woodland saprotrophs. English Nature Research Report No 597. Ainsworth AM 2004 BAP fungi handbook. English Nature Research Report No 600. Allen MF 1991 The Ecology of Mycorrhizae. Cambridge University Press. Boddy, L 1994 Wood decomposition and the role of fungi: implications for woodland conservation and amenity tree management. Pp7-30 in: Spencer J & Feest A (eds) The Rehabilitation of Storm Damaged Woods. University of Bristol: Department of Continuing Education. Harding PT & Rose F 1986 Pasture-Woodlands in Lowland Britain: a review of their importance for wildlife conservation. Abbots Ripton: Institute of Terrestrial Ecology. Marren P 1991 Bracket fungi and their role in nature. British Wildlife 3: 1-9. Rayner ADM 1993 The fundamental importance of fungi in woodlands. British Wildlife 4: 205-215. Stokland J N, Siitonen J & Jonsson BG 2012 Biodiversity in Dead Wood. Cambridge University press.